The period covered by Arts:Search is 1903. Available soon. Edited by G.M. Temple. 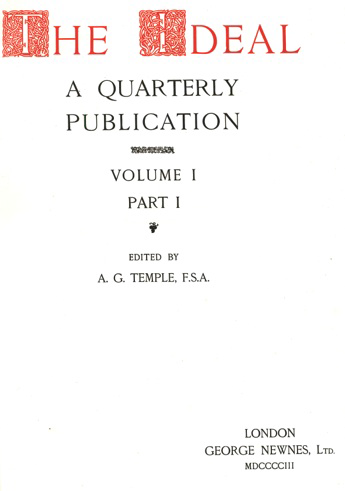 The most short-lived of art magazines - only one issue was published [volume 1, part 1, 1903]. It was extremely large in format [55 cm x 40 cm], issued in a box, and in a limited edition of only 250 copies. The cost of production may account for the fact that no further issues were published. Articles include ‘Celebrated Artists and their Work – 1. Valasquez’ by Frederick Wedmore; ‘Artists’ Ideals of Women’ by Sir Wyke Bayliss; ‘A Moorish Garden: A Dream of Granada by Lord Leighton P.R.A.’ by G.M. Temple; ‘The Venice of Turner’ by Bernard Capes; ‘Illuminated Horæ: Some Early Netherlandish Examples’ by W.H. James Weale; ‘Fortuny’ by A. Lys Baldry, etc.